South Africa: Who Is Cyril Ramaphosa? This interview was first published before Ramaphosa was elected president of his party, and of the country. Alongside Nkosazana Dlamini-Zuma, immediate past chair of the African Union Commission (AU), who was a cabinet minister under Presidents Mandela and Mbeki, Cyril Ramaphosa is a front-runner in next month's election of a new African National Congress (ANC) leader. The winner of that contest is likely to become South Africa's next president. President Jacob Zuma's term ends in 16 months, although there are pressures for him to go earlier amid corruption accusations. As an internal leader in the fight against apartheid, Ramaphosa is credited with organising miners into the country's biggest trade union. He became ANC secretary-general and its lead negotiator in ending apartheid and in writing a new, democratic constitution. He then became a leading businessman in post-apartheid South Africa and is now deputy president of the party and the country. Despite his prominence, he has been described as a private, even enigmatic, person. In an interview with AllAfrica's John Allen, Ramaphosa's biographer, University of Cape Town political scientist Anthony Butler, lifted the lid on the businessman/politician's life. Our readers across Africa know Nkosazana Dlamini-Zuma from her time at the AU. But they don't know Cyril Ramaphosa nearly as well. What were his origins? His mother worked as a clerk and also as a home brewer and a home-maker. Yes, that's right. One of Cyril's brother's earliest memories is of his mother selling home-brewed beer from their house in Chiawelo, a part of Soweto that was the place to which people of Venda ancestry were relocated in the 1950s and 1960s. This was under the apartheid policy? That's right. It was part of the 'retribalization' policy of the apartheid government to locate people by ethnic groups and also to teach in indigenous languages at primary school level along ethnic lines. This was quite a shock to Ramaphosa and his family, because his early years were spent in a multi-racial environment [in Western Native Township, west of Johannesburg] before being forcibly relocated to Soweto. He was a hard-working student, someone who was very much shaped in his early years by his Christianity. That was something that came across strongly from all the people who knew him. But he was on the 'liberation theology' end of active Christianity, which was in many respects close to the black consciousness movement [espoused by Steve Biko], so there was a significant overlap. Ramaphosa was described by his friends as perhaps more religious than political. although politics and religion were inextricably related. From a pretty young age. When he's in his early teens he's already politicized. But he's also an impeccable student. Smartly dressed, always striving to be top of his class and not quite succeeding but being always in the top three or four. A perfectionist. He went to Sekano Ntoane High School, which was a little way from his house and was not ethnically exclusive. According to Cyril's friends, one of the most wounding elements of his early school experience was ethnic prejudice against people of Venda descent – particularly from Zulu- speaking teachers, but also from children in the school who expressed a good deal of prejudice. At that stage there was limited opportunity to experience racial prejudice because there was almost no interaction with whites. When that did happen for Ramaphosa, it was largely through church-associated organizations. When Cyril got to the age of about 16, his parents decided he should attend high school as a boarder in Sibasa, his father's place of origin [in Venda in the far north of South Africa]. That was quite commonplace at the time and one of the motivations was to take him out of a very volatile political environment in Soweto, at a time when black consciousness is emerging as an important phenomenon in the politics of Soweto. There he begins to show unusual characteristics: he arrives and immediately he's elected head of the Student Christian Movement, a position that is quite important in that school at that time, as a major body organizing students to do good works. By convention that position would go to a senior student from the previous year but people excitedly came to the head teacher and said, "We've decided to elect this new boy." Cyril used that position in a variety of ways. Two of them are quite striking. One is that he was involved in evangelism in the rural areas, very poor, rural areas around Sibasa. There I think he learnt to interact with people in poorer areas in a way that he would never have been able to if he'd spent his entire school career in Soweto. He became familiar with the problems that people faced. I think it was a formative experience. Secondly he was very critical of many of his teachers. The school was far from being in disarray – it had a number of capable teachers, but it also had a number of lazy, poorly-prepared teachers and Ramaphosa took them to task and complained directly to the teachers and told them their work was not sufficiently good. He also harangued his fellow students and made them re-do their work. Quite a number of his fellow students went on to different leadership positions in the black consciousness movement but Cyril was always the leader among their group. I think he never lost that ability to talk to religious groupings, and he always retained his relationship with the local church in Chiawelo in Soweto. He went from there to the University of the North at Turfloop? That's right. Turfloop moves into a period of upheaval just as Cyril arrives and he becomes drawn into – as everybody else does on the campus at that time – into a black consciousness revolt against the very conservative university administration and much of the teaching staff. Turfloop was designated under apartheid to do what? It was a so-called "bush college" designated for people essentially from the northern provinces of South Africa. It was not an exclusive ethnic college but one that drew people from all of the northern districts of South Africa, many of whom lived in Soweto. It was a relatively small college – the number of students was in the very small hundreds – but it was a period in which universities were in upheaval across South Africa and he was drawn into those upheavals. He remained with the Student Christian Movement (SCM), which was relatively unfashionable. There was a somewhat more radical, even for a religious grouping, University Christian Movement, which was more of a Christian black consciousness radical organization that was a competitor and that tended to dominate the student elections. But everybody was drawn into these conflicts, and under circumstances that are not entirely clear, Ramaphosa was detained midway through his university career and was never able to resume studies. By the Security Branch? For his activities on campus presumably? He later graduated [as a lawyer] through the University of South Africa [studying by correspondence] but much later – it took him many years. Is there any analogy between the influence of black consciousness on Cyril Ramaphosa and on Nkosazana Dlamini-Zuma? I think probably yes. Black consciousness was in the 1970s the dominant political ideology among radical black youth, particularly in the middle classes, people who attended university. And the ANC and the Pan Africanist Congress [PAC] were more or less invisible. Not entirely so, because Ramaphosa's brother, Douglas, for example, who is younger, was an ANC activist. But neither their father nor Cyril was aware of that fact at that time. Black consciousness in its different forms was certainly far more important [than other political groupings] in the upheavals of 1976 and the two years following. The ANC in exile was very successful at taking credit for the mobilizations and has continued to do so to this day. His father's role as a policeman in Soweto – what effect did it have on him and on his subsequent political life? According to Cyril's brother, Douglas, their father – Samuel – was a very important influence on Cyril, that in fact they were very similar. Certainly Cyril has inherited quite a conservative understanding of institutions, the rule of law and, perhaps above all, constitutions. So, much to the annoyance of people who worked with him in the SCM, the National Union of Mineworkers, the Confederation of South African Trade Unions (Cosatu), formed in 1985, and later on in the ANC, he was to some degree obsessional about constitutions. They should be followed, but also people should be fully aware of what the constitution means and should embrace and affirm that constitution. That I think probably comes in part from his relatively conservative family, a Christian family with a policeman at his head and also, although in a relatively positive manner, a patriarchal family in which the father was the head. So I think it did have an effect. It also probably had an effect on how he was seen. Certainly his brother found it very difficult to have a policeman as a father at that time. For Ramaphosa, perhaps because he was the older brother, it was more expected that he would take on the role of supporting the family and not rebelling against his father. But both of the brothers talked to their father about the problem, and they were pleased when he stopped being a policeman a couple of years before the retirement age. Hearing you talk of his brother, and of others who spoke to you about him, I'm reminded that you say in your biography that he wouldn't help you with the book – no interviews, no introductions to others, no access to documents. Why was that, do you think? I think he's a private person and he's uncomfortable, certainly talking about private or family matters. He also likes to compartmentalize his life so he has friends from different and perhaps antagonistic groupings of people in South Africa, including business people and trade unionists and religious activists, and he tends to meet them apart from one another rather than together. So he likes to manage relationships. So your judgements come from speaking to people around him and not to him? Primarily, yes. Although I have spoken to him a number of times since and I met with him a number of times during the preparation of the book and he read the manuscript and identified some errors. But the book was based on the testimony of people who knew him. He didn't talk to you about his feelings or motivations when correcting errors? No. Again, to some extent I used other materials but I was and remain sceptical of politicians' interpretations of their own motivations. How did he become involved with the mine workers? With many other black consciousness activists, he was becoming aware in the late 1970s of the limitations of black consciousness as a project. He could see the power and importance of organized labour. There were two main sets of institutions through which you could act politically at the time: the churches and trade unions. He was interested in unions and was asked to organize by a union federation some described as a black consciousness confederation. There was huge potential, because it was an economically pivotal sector in the South African economy, but there was very little union penetration. The workers were migrant labourers with permanent homes in rural areas who worked on annual contracts, living in compounds where they were quite tightly regulated and policed. There was huge potential for union penetration that hadn't been realized, really since the 1940s. When Ramaphosa started organizing, the workforce had for two or three decades been drawn not just from South Africa but from other countries across the region. That made union organization even more difficult: a migrant labour system, controlled compounds and very tight collaboration between mine managers and mine security on the one hand and the police and Special Branch [South Africa's security police] on the other. At that time, there was interest in the more progressive mining houses, particularly Anglo American, in some form of unionization. Anglo was trying to learn lessons from other industrializing, middle-income countries, about how to minimize the disruption caused by unofficial wildcat strike action in mines and other organized heavy industries. They could see a role for a certain kind of union organization. So there was an opportunity that if unionists played their cards right, the union would be able to establish a foothold that could be built upon. But the mining houses were nervous about political unionization; what they wanted was an organized bargaining partner because they wanted to stabilize their work forces, to build up skill levels and to establish more permanent work forces with more regular patterns of negotiations over working conditions and so on. That was the opportunity Ramaphosa seized. He was fortunate to meet his long-term collaborator, James Motlatsi, a formidable organizer, relatively early in the process. Once the National Union of Mineworkers (NUM) was formed, they found there was overwhelming enthusiasm. We could attribute this to their massive organizational skills and there was an element of that – they clearly were good at what they did. But many union organizations in the 1980s expanded very rapidly. Unions became vehicles for political mobilization in the absence of an alternative. Some of the conservative mining houses were very resistant, and they tried to intensify other mechanisms of control, as they had done over many decades, particularly by breaking up work operations by ethnic group. There were a number of different approaches but it was important for an industry that wanted to become more skills intensive to allow union organization of a certain kind, for their own economic reasons. They were to some extent surprised by the rapidity and intensity of that organization and also by the success of the unions in not just recruiting but also in using the law against the mining houses. The law was important because many of the problems that workers faced in the mines were the result of arbitrary and illegal actions, either by other workers, particularly white employees of the mines, or by the managers. Simply by applying existing administrative law and employment law the unions were able to improve dramatically the situation of many workers who were at the time facing arbitrary dismissal and violence. That was perhaps the most surprising element of the NUM's rise, supported by extremely talented lawyers for the unions. Labour lawyers were able to tie up the mining houses in legal actions that were very costly. That made it sensible, for their own economic reasons, to reduce violence on the mines, to improve working conditions and to remove arbitrariness that had been a mark of the mines as places of work. Through the negotiation process the heads of the mining houses and the heads of the unions developed quite close understandings of one another as negotiating parties. Ramaphosa was by all accounts an extremely accomplished negotiator who could combine a wide range of different tactics. 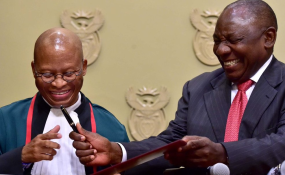 To some extent negotiation is about bringing your own side on board, and he worked as a team with other people in NUM, particularly James Motlatsi who had an important role in rallying the troops behind whatever negotiating position Ramaphosa was able to agree. He used intimidation, charm, humour in rapid succession at the negotiating table. He inspired almost awe among his own activists within the union structures because of his exceptional calm under pressure. There was enormous respect for him because he was entirely unfazed by the negotiations process, by the pressures that were an inevitable part of that process. He never showed any signs of experiencing that pressure. How did he respond to the use of violence by strikers? On a number of points in his political career has shown great repugnance towards the gratuitous application of violence. I think that's genuine, but the mines were a very violent environment and continue to be. In the mid 1980s, when the union was off the ground but still relatively disorganized, the head offices of the union were occupied by workers who had arrived with grievances – many of them had been sacked – and then they refused to leave. Ramaphosa was unwilling to remove them by force. That was brought about in the end by the president of the union and his long-term friend Motlatsi. It may be that there was something else at play as well – perhaps there was a degree of political intelligence at work and Ramaphosa was introducing a degree of plausible deniability into his relationship with violence. But who knows? When Nelson Mandela came out of prison in 1990, Ramaphosa was constantly at his side as head of the national reception committee. How did that come about? I suspect that it was in part because he had been such a significant leader of the internal opposition to apartheid. The NUM was the largest union by far in Cosatu. He was an important actor in the Mass Democratic Movement that was formed as an alliance by Cosatu and the United Democratic Front (UDF) in the late 1980s. He was also identified by potential allies in the South African Communist Party [SACP], who saw him as a potential partner and mobilizer. When the ANC was re-formed as a political party in 1991, there was a lot of jostling for alliances, partly ideological, partly to do with different exile, prison, trade union and UDF groupings. So Ramaphosa was a sought-after person. By both communist and nationalist elements? Yes, in part that started with union's fund-raising. Ramaphosa got money from the Moscow-aligned union federation but also from the U.S.-aligned labour unions. But he was pretty aligned to the left of the SACP in the early 1990s. The SACP was quite deeply factionalized in exile. What was his relationship with Mbeki over this period? It seemed to be quite a poor relationship, and that may be because he was close to Chris Hani [the popular general secretary of the SA Communist Party from 1991, who was assassinated in April 1993]. Hani and Mbeki were the key contenders for the ANC leadership for the future, post-Mandela, post-[Oliver] Tambo [the ANC's leader from 1967 to 1991 and ANC chair until his 1993 death] period. But there was also a strong sense of antagonism among people in the NUM towards the exiles that took a long time to go away – in fact hasn't gone away. This is an old division. It constantly riled people like Ramaphosa, I think, that the exiles returned believing that they were going to take over. Soon after return the ANC had its first conference after being unbanned by the government, Cyril Ramaphosa was elected secretary-general of the party. Was that a surprise? Almost everything was uncertain. It was the first conference for decades and it contained a lot of unknown quantities. It was a meeting of people who'd been in prison for decades, who'd been in exile for decades in all kinds of different settings, and of people from the domestic struggle, who had not been ANC members but who had been aligned with the ANC, either loosely or more strongly, and the rules were new. The fact that OR Tambo was ill meant that Mandela's election as president was unopposed and straightforward, but beyond that everything was up for grabs. How did Ramaphosa come to be the chief ANC's negotiator in talks for democracy? I think a grouping of SACP people, in particular, felt that Ramaphosa was the most experienced negotiator available for the transition. I think it was important symbolically that the leader of the negotiations was a domestic activist and a black South African. The number of choices from the domestic environment was quite constrained, and he was the obvious choice. Mbeki was the alternative and in many respects this was unfair to Mbeki, who had been arguing for negotiations in exile – perhaps the leading exponent of negotiations – while the SACP and Joe Slovo [party general secretary until 1991] were saying, no, we have to have a revolution, we can't have a negotiation. Then suddenly the SACP changed position 180 degrees and said, yes, we must have negotiations but they have to be led by Ramaphosa. I was told by one reasonably reliable source after my book came out by that there were several attempts to remove Ramaphosa as chief negotiator, and that Mandela had caved in to remove him, but that he'd been pushed back into line and persuaded that Ramaphosa had to stay. Why did Mandela choose Mbeki and not Ramaphosa as his deputy president? Well there are very different views of that. My opinion is that Mbeki was the obvious choice but that Mandela needed to avoid a situation in which he was seen to be perpetuating an Eastern Cape dynasty [of Tambo, Mandela and Mbeki succeeding one another]. So he went through quite an elaborate process of consultation about who the next leader should be, but consulted people who couldn't know Ramaphosa – including the leaders of neighbouring countries, the Front Line states, and people who'd been in exile with Mbeki. There was very little support in that consultation process for Ramaphosa. I think that consultation was a phoney consultation designed to produce the outcome that Mbeki was the experienced man, the continental statesman who had worked with Tambo and so on. Is there evidence to substantiate the story that Mandela came to regret anointing Mbeki? Mandela did say later, after he'd stepped down as president, that he had wanted Ramaphosa to take over. I think this was after Mbeki had affronted Mandela by essentially saying there was no further role for Mandela in leadership, which he did more or less as soon as he'd taken over. And then Mandela did say he wished he'd chosen Ramaphosa but whether that was actually the case at the time I'd be surprised. Remember that Mbeki's exile faction was the ascendant faction at the time. Also, we must remember that Ramaphosa was young, in his early 40s, so it was legitimate to say that his time may come later. Did Ramaphosa then go off in a huff to join the business world? I'm not sure that would be the right way to describe it – remember he did continue to chair the constitutional negotiations all the way through to 1996. So there was a sign there that he was aware of his responsibilities to complete that process. You could argue that he still was keeping open his options for a challenge in 1997 for the ANC presidency, but probably not. The South African economy of that period was dominated by Anglo American and that company was destined to be the key launchpad of black economic empowerment (BEE), because it needed to change from its rather ramshackle conglomerate character into a more focussed business organization. So key BEE deals involved spin-offs from Anglo of different kinds, and one of those was the one Ramaphosa led. Not initially. The early deals were very unfavourably structured for the supposed beneficiaries. They depended on the rapid repayment of loans on the basis of profits accrued through dividends earned by empowerment groups. That all fell apart very quickly in 1997 with the Asian economic crisis. A lot of the early deals went under. In the second phase of empowerment, Ramaphosa became more canny about how to approach the deals – at becoming an empowerment partner of companies that were going to deal in a straight way with Shanduka [his company] and allow Shanduka to grow. He was also involved in the formulation of the new broad-based black economic empowerment [BBBEE] policy in the early 2000s. That policy was something of a shift away from an ownership-targeted policy. It was more broadly based, not focussed solely on equity. It introduced a scorecard which allowed companies to earn brownie points by appointing more black managers, spending money on training, having a supply chain with black-certified companies in that supply chain, and so on. He became quite active in that area, in skills development initiatives and the attempt to develop a wider base of small black-owned businesses and to integrate those into a supply chain of companies. The early phase was viewed by many ANC leaders as a failure, having been conceived, as Mbeki described it in an essay in the 1980s, as the creation of a black bourgeoisie. The shift of emphasis was keen on empowering people beyond the usual suspects. You could argue it's still been unsuccessful in many respects. Much of the focus of BEE has continued to be on attracting the right politically-connected people as your empowerment partners to solve political problems for you. How damaging for Ramaphosa was the Marikana massacre of 2012 [in which miners striking against a company of which he was a director were killed]? The first is that the commission of inquiry took a long time to reach fairly inconclusive findings about the causes of the killings and did not find against Ramaphosa. So that to some extent neutralized media hostility towards Ramaphosa. Secondly the episode to some degree made Ramaphosa a victim because he has been attacked in quite an uncontrolled, unnuanced way by many civil society activists for his role as a director. One of Ramaphosa's weaknesses in the ANC is that he has always been too popular among the white middle-class and intelligentsia, so to find that group relentlessly critical of him has actually come to his aid to some extent. It helps him if they are no longer constantly trying to defend him in media promotion. Thirdly he did a very good job of defending himself publicly. He was quite successful in advancing a counter-narrative of what happened, which seems over time to have satisfied most of his critics. Why did Jacob Zuma choose him as his running mate in as party deputy president in 2012 [when Zuma was challenged for the leadership by another former NUM leader, Kgalema Motlanthe]? I think we have to assume that Zuma chose Ramaphosa [in the race against Motlanthe] for the same reason that Mbeki earlier chose Zuma [as his deputy president] – that he thought he could pull the rug out from under him when the next conference came closer [in December 2017]. He may have thought Ramaphosa lacked a significant support base in the ANC to mount a challenge for the succession. At a guess, a second reason might be some kind of clever strategic deception on the part of Gwede Mantashe [current ANC secretary-general and also a former NUM leader], who may have manipulated Zuma into seeing Ramaphosa as the right choice, as someone who gives credibility to the government. From the point of making Ramaphosa look attractive, it still surprises me how Kgalema Motlanthe ran his own campaign [against Zuma]. Motlanthe actually didn't campaign despite apparently being the umbrella group for anti-Zuma organizers. So it may be that that whole campaign was a ploy and the objective was to secure the deputy presidency for Ramaphosa. But we don't know. Do you think it's correct to assert that Zuma, as president, has given Ramaphosa, as deputy president, poisoned chalices in the assignments he has allocated to him? Certainly, yes. You would have to say that the deputy presidency of the ANC is a poisoned chalice unless it's going to be a stepping stone to the presidency. The deputy president ends up chairing the committees the president doesn't want to chair. All of the hard policy issues that the presidency deals with but that the president doesn't want to deal with are given to the deputy. The deputy presidency in the ANC has never been much of an office, and when Thabo Mbeki became president he took away all the infrastructure of power from the office of the deputy president in government as well. A number of the tasks that Ramaphosa was given in government involved a lot of travel. Domestically, giving responsibility for the minimum wage to Ramaphosa was a very clever move on Zuma's part. Really it should have sunk Ramaphosa because he was very dependent on an alliance with Cosatu trade unions if he was to have a chance of succeeding, and the Cosatu position has long been unrealistic on the minimum wage. Curiously Ramaphosa has managed to steer a middle course between the different constituencies. We haven't reached the outcome of the process yet, but the accommodation that Ramaphosa has overseen did not make big business too unhappy and it was acceptable to the unions. In conclusion, he seems to have been a person who played his cards, certainly politically, close to his chest and has also played a long game. Is that a fair assessment? I think that's right. When he was a teenager he did believe that one day he would be president and I think that that ambition has probably remained across his whole life. Is he committed enough to become president? Ah, I think so. I think so. There was a period especially when he was in business when he gave out the sense that he didn't want this fight. He certainly gave that impression and even quite close friends of his told me that they believed he had no further ambitions in that direction, or realized that it wasn't possible for him. Could that be him playing his cards close to his chest? It could well be. We can see in the way the campaign has unfolded over the past four or five months that he's made preparations. Both of the key slates have teams of aspiring leaders [with] quite long-term preparations to be in a position where they can build a credible coalition. Have allegations of extra-marital activities damaged him? I don't believe so. It's hard to know of course. We don't have reliable surveys or other evidence, but it doesn't appear to have slowed him down. What was interesting for me was how it didn't fly on social media. When it comes to that kind of story, it's social media rather than established media where you expect it to take off. There was an attempt to build a social media campaign but it didn't take off, despite the fact that there was investment into the resources to make it take off. Does he have the ability to take the ANC into a coalition in 2019 if its share of the vote falls below 50 percent? I think so. I suspect that that won't be necessary – a Ramaphosa or Zweli Mkhize [an alternative to Ramaphosa and Dlamini-Zuma] would be able to salvage enough of the ruins that Zuma has left behind him for them to win the national elections. So the question of a coalition would be most likely to arise in the provinces of Eastern Cape and Gauteng. What might he do if he loses the ANC election this month? He's just published a book on his cattle. He has Ankole [originating in Uganda], Boran [from Kenya] and a variety of Nguni cattle on his very large farm and reportedly pulls pictures of his cows out of his wallet and shows them to people. He has named all of his cows so one option for him is to devote more time to what seems to be a real passion. Another would be to lead a break away and to attempt, I would assume, to form part of a coalition with a broad range of opposition parties in advance of the 2019 elections. Anthony Butler is a professor in the Department of Political Studies at the University of Cape Town and a former fellow of Emmanuel College at the University of Cambridge. His biography of Ramaphosa is published by South Africa's Jacana Media.